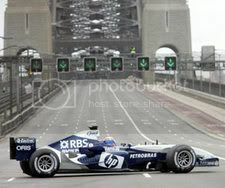 Australian F1 driver Mark Webber said it was special but eerie to have the Sydney Harbour Bridge all to himself today after having completed five up and down laps of the bridge. According to him, ride was bumpier than he expected, but everything went well. "To drive across the bridge was pretty eerie obviously, having it shut off and it was special for the team, the amount of effort they have all gone to have the bridge shut off," Webber said. However,there were no public viewing areas (this event was more made-for-TV, only a few photographers and journalists). 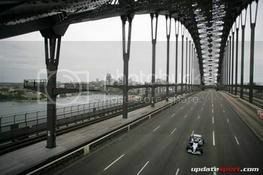 In what many thought was an excess of conservatism, the bridge was closed for five hours while Webber spent only 10 minutes driving, and the public was steered away; even the vantage point of Observatory Hill was out of bounds. A few lucky fans sighted Webber afterwards when he made a brief appearance at Hickson Road Reserve, where a big TV screen had been set up for the event. 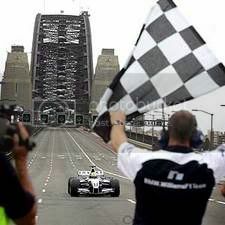 "Thundering with 900bhp over that time-honoured structure was an amazing feeling, the engine sound over the ocean was fantastic.” Mark Webber after completing 5 laps of the Sydney Harbour Bridge.